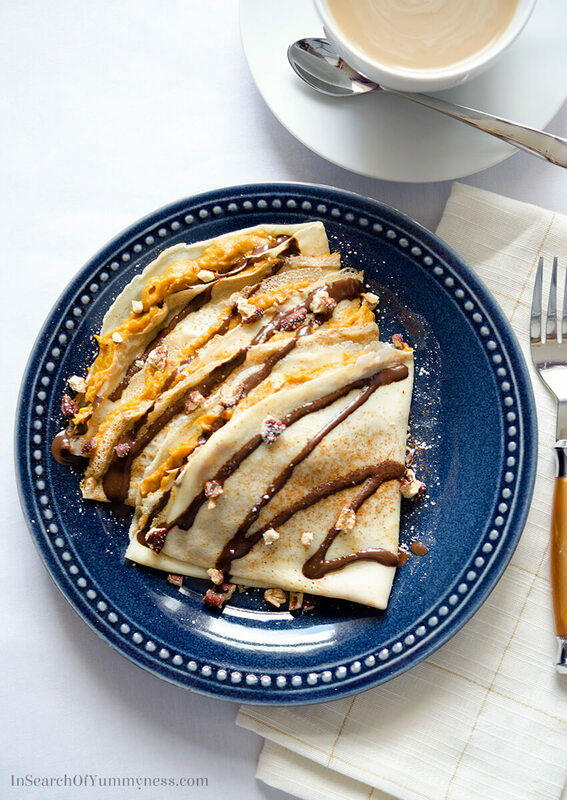 These pumpkin pie crepes, with chocolate syrup and toasted pecans, are a great way to end your Thanksgiving dinner. The best part is that you can make this all on your stovetop – leaving the oven free for your turkey! As much as I love classic pumpkin pie, sometimes it just doesn’t feel very exciting. I mean, there’s nothing wrong with the traditional pie – crust, a baked filling, and maybe a little whipped cream on top, but sometimes I just want more. I started playing around with non-traditional pumpkin pie recipes a few years ago. Up until then, my Thanksgiving tradition was to make the pumpkin pie recipe from the back of an E.D.Smith Pure Pumpkin can label. The recipe is solid – it makes an excellent pumpkin pie, but I was getting bored of eating the same thing every year. In 2013, I published a recipe here for pumpkin pie crepes. The recipe was pretty simple: basic crepes, and an eggless pumpkin pie filling with whipped cream, topped with even more whipped cream and a sprinkle of cinnamon. It was a tasty alternative to my once-loved pumpkin pie, and an excuse to eat a ridiculous amount of whipped cream. This year I was determined to take my pumpkin pie crepes up a few notches. I’m a stronger cook now, and I knew that I could do better. It took a few tries, and I definitely ate way too many crepes in the process… but, oh my goodness, the results are SO GOOD. First of all, I realized that my original pumpkin pie crepes were more like pumpkin pie burritos. I don’t know why I plated them as rolled crepes… they’re much more attractive when you fold them into triangles. They’re less messy this way too. The next thing I did was add a crunchy element to the plate, to add texture to an otherwise very soft dessert. I considered pumpkin seeds, but they didn’t seem quite right. Eventually, I ended up using toasted pecans because a) they’re my favourite nut, and b) they just seem seasonally appropriate. After that, I wanted to find a way to add more sweetness to the dish, to move it away from a breakfast-y item and place it in firmly in the dessert category. Caramel sauce was a tasty idea, but it didn’t look that great. I was tempted to use marshmallow fluff instead of whipped cream, and I still think that would be a tasty option, but the sticky texture of the fluff makes it a bit difficult to work with. Ultimately, I ended up going with chocolate sauce, which not only makes these pumpkin pie crepes look super fancy but also tastes amazing with the other ingredients. So after several trials and errors, I eventually created a version of pumpkin pie crepes that I’m really proud of. This is definitely a dish that I’d be happy to serve to friends all fall-season long! I kept the filling more or less the same, omitting the extra cinnamon and ginger and just using more pumpkin spice. If you don’t have pumpkin spice, and can’t find it at your grocery, (sometimes labelled as pumpkin pie spice), you can easily make your own. The Kitchn has a recipe for DIY pumpkin spice that looks pretty good. The crepe batter is a (very slightly) modified version of the plain crepe recipe in Julia Child’s Mastering the Art of French Cooking cookbook. I’ve been using that recipe since I was a teen, and it’s the best recipe that I’ve tried. For some reason, the versions that have sugar in the batter just never work out for me. The crepes really don’t need to be sweet though. 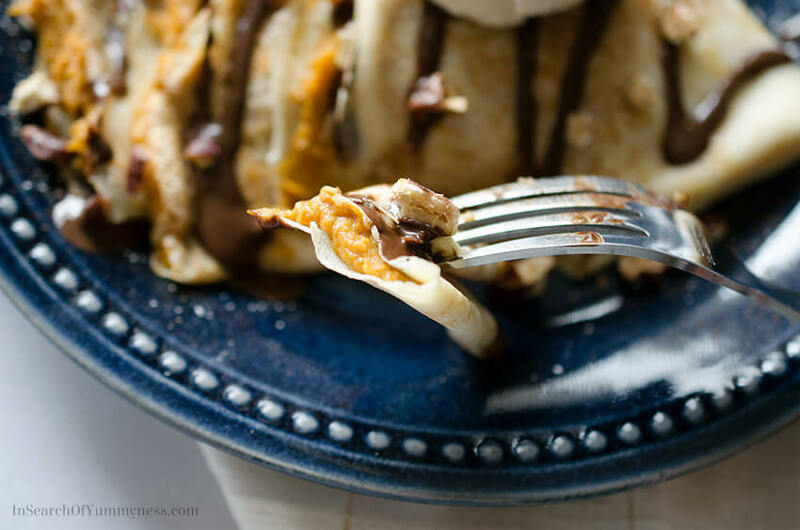 By the time you add powdered sugar and chocolate syrup to these crepes, they’ll be more than sweet enough to qualify as a dessert. 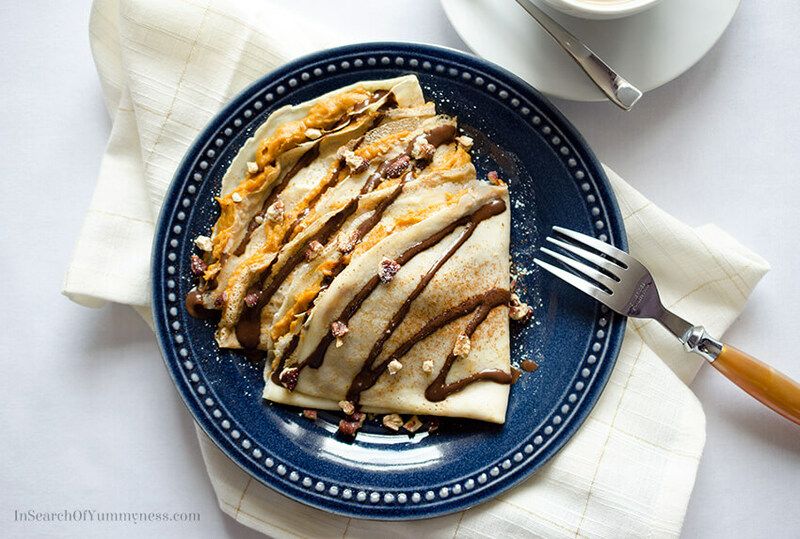 These pumpkin pie crepes, with chocolate syrup and toasted pecans, are a great way to end your Thanksgiving dinner. The best part is that you can make this all on your stovetop - leaving the oven free for your turkey! Add all crepe batter ingredients into a blender jug. Blend on high until smooth (about 1 minute), stopping periodically to scrape down flour that may be stuck to the sides of the jug. Refrigerate batter for at least 30 minutes, or up to 1 day. This step allows the flour to absorb moisture, and will reduce the amount of air bubbles in the batter. Combine all ingredients in the saucepan, and place over medium-low heat. Cook until heated through and fragrant, about 5 minutes. Stir often to prevent the mixture from sticking or burning. Heat an 8-inch non-stick pan over medium-high heat. When the pan is hot enough to make beads of water dance, you're ready to cook. If the water evaporates instantly, your pan is too hot. Brush the pan lightly with melted butter. Pour in about 3 tablespoons of batter (a bit less than 1/4 cup) and tilt the pan in all directions quickly until the batter evenly coats the bottom of the pan. Cook for 30 seconds, or until the edges have turned brown. Use a rubber spatula to release the crepe from the pan, then flip over the crepe and cook for another 20 seconds or so. Transfer cooked crepe to a plate, and cover with a kitchen towel to keep warm. Repeat with remaining batter, brushing on butter as needed. You can put pieces of parchment paper in between the crepes to prevent them from sticking to each other. Spoon about a tablespoon (or more if you like) of the pumpkin filling onto a crepe, and spread out evenly. Fold the crepe in half to make a semi-circle, then in half again to make a triangle. Repeat this process for the rest of the crepes. 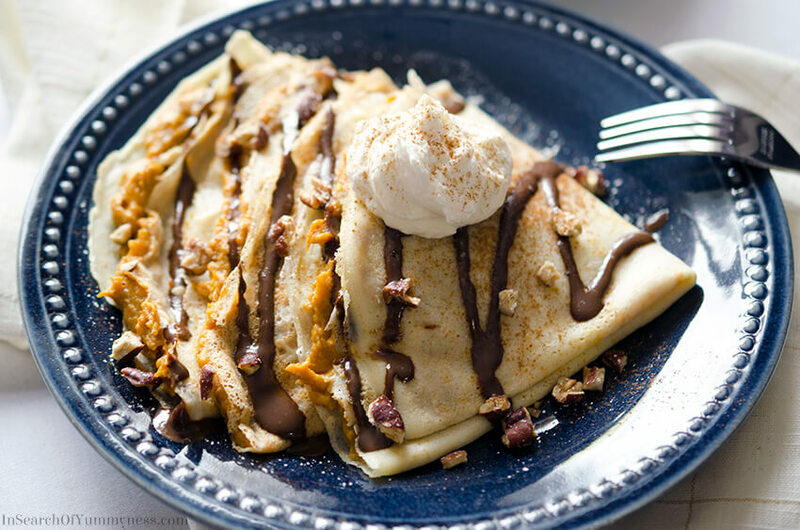 Garnish crepes with whipped cream, ground cinnamon, powdered sugar, chocolate syrup and toasted pecans. Serve immediately. Refrigerate unused portions promptly. Don't try to add your batter to the pan a tablespoon at a time! Measure 3 tablespoons into a small container, and pour from that into your non-stick pan. The crepe batter should be the consistency of a light cream (so not as runny as milk), and should be thick enough to coat the back of a spoon. If the batter is too thick, you can thin it out by adding a little bit of water. If you do not have a blender, add the flour to a bowl then gradually add in the liquids. Mix the batter well, then strain to remove any lumps before putting the batter in the fridge. Crepe recipe adapted from Matering the Art of French Cooking, by Julia Child. Pumpkin pie filling recipe adapted from the E.D. Smith Pumpkin Pie recipe. This page contains Amazon affiliate links that help to support this website. These look so yummy! I’m always in search of something a little different than traditional pumpkin pie! Thanks Amy! If you try it, let me know how it turns out! So fancy – gorgeous and delicious! I love this creative twist! Thanks Melissa! I love that they look fancy, but are actually pretty easy to make! Wowza, do these look amazing. It’s like having a gourmet French breakfast right in the palm of my hands! Love!